In 1989 Wim Wenders was commissioned by the Centre Pompidou in France to make a film about the fashion industry, a prospect he did not initially relish but nonetheless accepted. 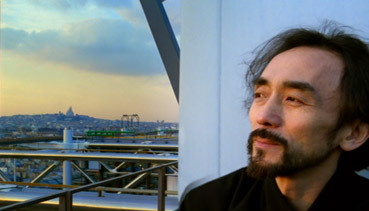 His decision to focus on Japanese designer Yohji Yamamoto grew from the discovery that the two most indefinably perfect items of clothing he owned were both designed by this man. The process of making the film prompted him to ponder the nature of identity and the possible relationship between filmmaking and fashion design. As an investigation of the fashion world, Notebook on Cities and Clothes reveals more about the filmmaker than it does about his subject, who is personalised through a series of interviews but abstracted through the director's experimentation with his own chosen medium of artistic expression. Armed with both a film camera and the then new tool of the video-8 palmcorder, Wenders discovers a kind of liberation in the freedom offered by the camcorder and the intimacy it allows, an early step on a voyage of digital discovery that many filmmakers would subsequently take. The rich beauty of the 35mm film images contrast starkly with the unflattering, high contrast fuzziness of those shot on the 8mm palmcorder, and Wenders is clearly fascinated by the juxtaposition of the two, placing one inside the other in the manner of a pre-digital picture-in-picture. Intriguing in itself, this inevitably focuses our attention more on the technique than the content, but does give rise to some forward-looking questions about the nature of originality in a soon-to-be-digital age. Occasionally I did find myself connecting with Yamamoto's thinking, as with interest in old photographs and more practical fashions, and I personally share his preference for the asymmetrical over the symmetrical. But the designer's clearly spoken but sometimes inexpressive English joins forces with the distancing effect of the technical handling to create a barrier to total engagement. This is in contrast to Wenders' own thoughts, which are clearly communicated through his softly spoken and articulate voice-over. As a result we learn more about Wenders the filmmaker than we do about Yamamoto the fashion designer, who is at his most communicative when allowed the full 35mm frame and to speak in his native language, nicely summing up his sense of temporal conflict by telling us that "I live in the past and dwell on the present." Appropriate to the title, the film is a cinematic notebook of off-the-cuff observations, partially explored ideas, and structural and visual experimentation, one that does not quite feel formed into a completed whole. My failure to completely engage with Yamamoto is best summed up by a conversation he has with Wenders in a Parisian pool hall, where I found myself too easily distracted by a background figure, whose agitation looked at one point as if it was going to explode into violence. As a whole, Notebook on Cities and Clothes takes an interesting and offbeat approach to its subject and includes involving and even insightful moments, but left this particular viewer little wiser about or sympathetic towards what he still regards, rightly or wrongly, as the most superficial and fleeting of all creative industries. Anamorphic 1.78:1, the transfer is up to the standard of the other films in this box set. It obviously has to cope with the low band fuzziness of pre-digital 8mm video, although, as with Lightning Over Water, this does deliberately and effectively emphasise the stark contrast between the video and 35mm imagery, and the 35mm looks very nice. Dolby mono 2.0 and surround 5.1 audio options are offered, and to be honest I preferred the Dolby 2.0, which spreads the track across the front speakers rather than confining it to the centre, and has a little more punch as a result. Another disc in Anchor Bay's Wim Wenders Collection that loses out to the US release, which not only has a director's commentary, but also deleted scenes and a featurette entitled Twelve Years Later. Here we get nothing at all. One of the few films in Anchor Bay's Wim Wenders Collection that failed to engage me on a meaningful level, despite some genuinely interesting asides. My low opinion of the fashion industry in general clearly doesn't help here, but I was perfectly willing for Wenders to convince me that there was more substance to it than I've been prepared to credit it with, but without that commentary it just didn't happen. The autobiographical elements, however, are always intriguing.